I know this is getting out late, but I wanted to write a quick post here about some goals I have for 2014. To complete my first 5K race by March 31, 2014. To complete my second 5K race by June 30, 2014. To complete my third 5K race by September 30, 2014. To complete my fourth 5K race by December 31, 2014. To complete 100 workouts during 2014. That’s about 2 workouts a week. Not impossible, and not unreasonable. To attend a Zumba class to see if I like it. If I like it and can do it, I am going to start going weekly. To save an additional $1400 as I did in 2013. To create a positive affirmations jar, into which I place a dated card each day that says something I like about myself, something I do well, or something nice someone else has said about me. At the end of the year, I’ll read all the cards to remember that I truly am a good person deserving of praise. To begin working toward my doctorate by taking required biology courses during the summer. To get out with my good camera more and capture what I see through my lens so that I can show my work in the faculty art show again this coming year. To reach my surgeon’s weight loss goal for me by June 2014, if not sooner, by doing what I’ve been doing all along. To reach my personal weight loss goal by December 2014, if not sooner by doing what I’ve been doing and adding more exercise. To try 3 new cuisines by the end of December 2014 and find at least one dish from each cuisine that I like and can recreate in my own kitchen. On my list: Indian food, Korean food and Thai food. Some of them are lofty goals, but I think they are doable and not unreasonable. What goals do you have for 2014? Here’s what I ate on my New Year’s Eve. I didn’t move much as I wasn’t feeling well–I seem to have picked up a cold that is taking residence in my head and nose which has made me feel pretty wormy. But I did manage to squeeze in 88 grams of protein, 59 grams of carbs, and 33 grams of fat. In the spirit of trying new things, we went out for Middle Eastern food and it was awesome! I could eat chicken shawarma, hummus, and pita pretty much every day. And kibbe? I DIE. So good! We will definitely be going back to the place we had dinner in the future. 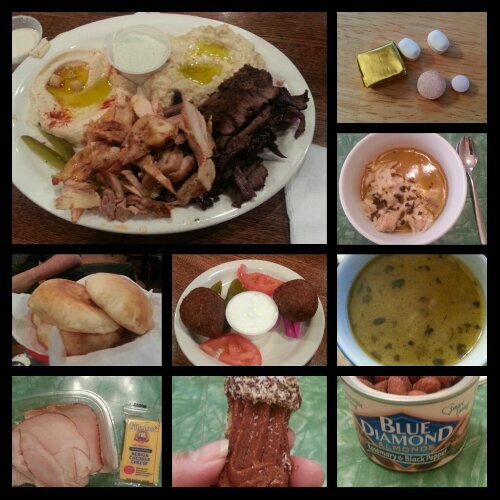 oday’s food choices, from upper right: multivitamin and calcium supplements x2, iron and B12 supplements; Mexican chicken lime soup with Monterey jack cheese; chicken lime soup broth; rosemary pepper almonds; chocolate shortbread cookie; deli sliced turkey and Tillamook cheese snack; pita bread; tibbe ball; chicken shawarma, hummus and baba ghanoush. Not shown: extra vitamin C and D supplements. This entry was posted in daily bites, eating, goals, la guerra, post-op, vsg, weight loss surgery and tagged aspiring runner, challenges, choices, eating, exercise, fitness goals, gastronomic adventures, goal setting, goals, omg I eat carbs!, post-op eating, post-op life, she's got skillz, trying new foods, trying new things, VSG, vsg realness, weight loss goals, WLS. Bookmark the permalink.